This tool will display a list of headers or page thumbnails on the left margin for navigation. "Mark Active Edit" places a bookmark at the location of the cursor, while "Go to Active Edit" will move the cursor to that location. The Fields and Tables dialog is primarily used for inserting fields and tables, though a number of other functions are available. All fields and tables are listed alphabetically - use the "Jump to" to navigate the list. Place the cursor where you want the field/table to be located. 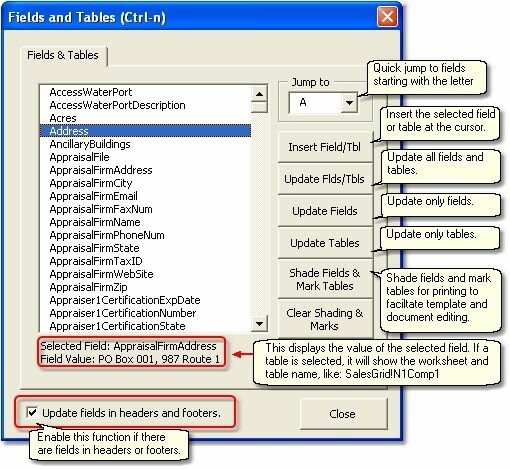 Run the Fields and Tables dialog and navigate to the field/table name in the list. Select this check-box to include field updates for headers or footers. For information on creating fields and tables, see Range Names. This feature delineates Narrative1 fields and tables in the printed document to facilitate template development. Fields are printed with gray shading and tables are marked with a red boarder on the left margin, enabling the editor to see and better manage the template development process. The ability to search field list by the field name, or a portion thereof. The ability to find fields in the document. Get New Fields. 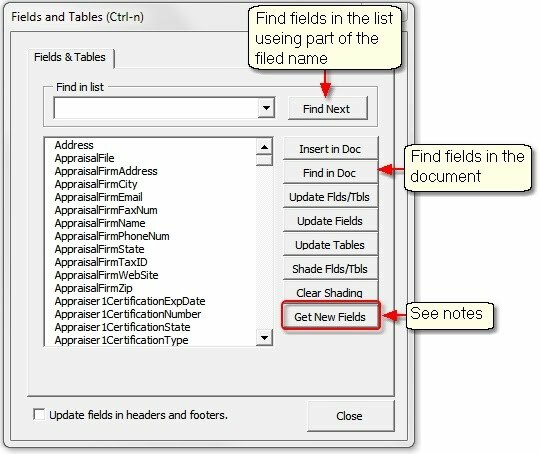 This utility will modify the fields in the Word doc to reflect new or changed fields in the Excel template. In Word, copy all the narrative associated with the sheet that was copied in in Excel. For illustration, assume there are two Sales Grids in Excel. In Word, select and copy all the text associated with the Sales Grid, from the introduction to the conclusion, including fields and tables. Place the cursor at the location where the new narrative for the second Sales Grid should begin. Select the worksheet from the drop-down that will serve as the source for the Fields and Tables in the selected text. Click the Map selected fields ... button. 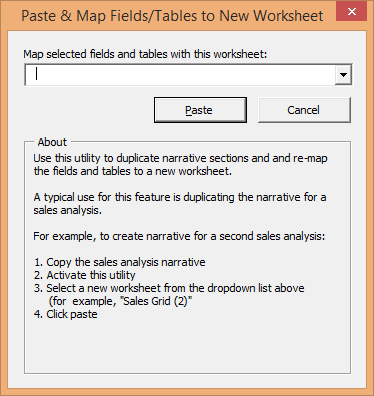 A message will display noting how many fields and table have been mapped to the new worksheet, in this example Sales Grid (2). Only original narrative can be re-mapped. In other words, the copied text cannot be copied again and re-mapped to a new worksheet. Expanding on the above example, if the Excel file had three grids instead of two, the narrative text for the first grid would be copied and mapped to Sales Grid (3). Tables: When re-mapping a table in Word, be sure to include a line before the table when selecting the text to be re-mapped. Didn't mean to activate this dialog? Simply click the button at the bottom left side of the form to return to the regular Fields and Tables dialog. This feature will move the cursor from a field or table in Word to the corresponding field or table in Excel. 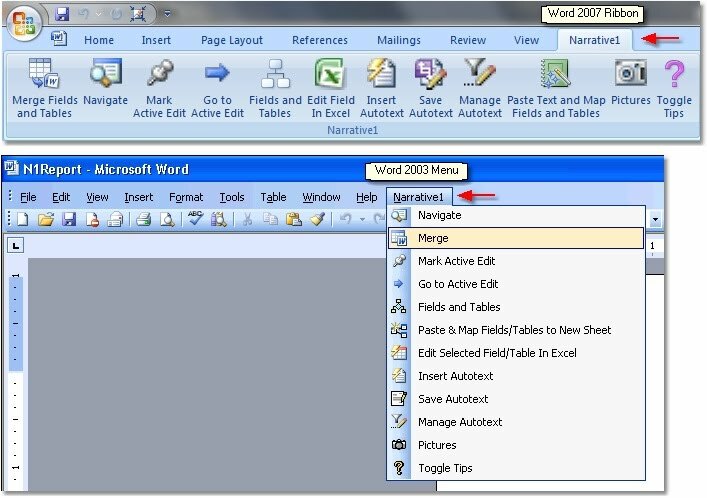 To jump from Word to Excel, simply click on a field or table, then select Edit in Excel from the Narrative1 menu. 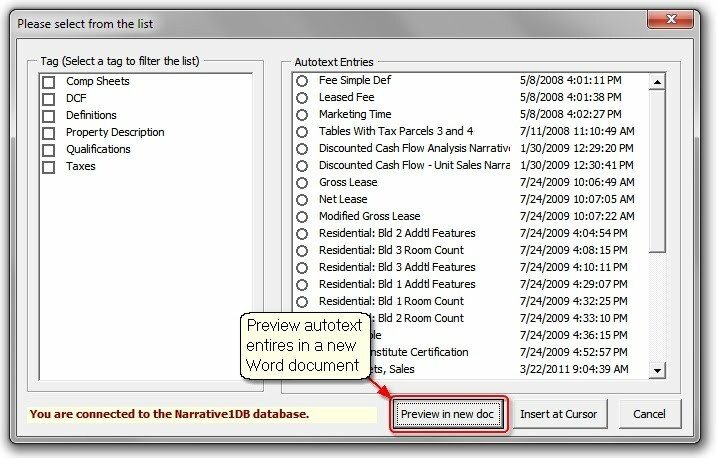 The Narrative1 Autotext is a database system for MS Word sections. A section can be as short as a single character, or many pages in length. 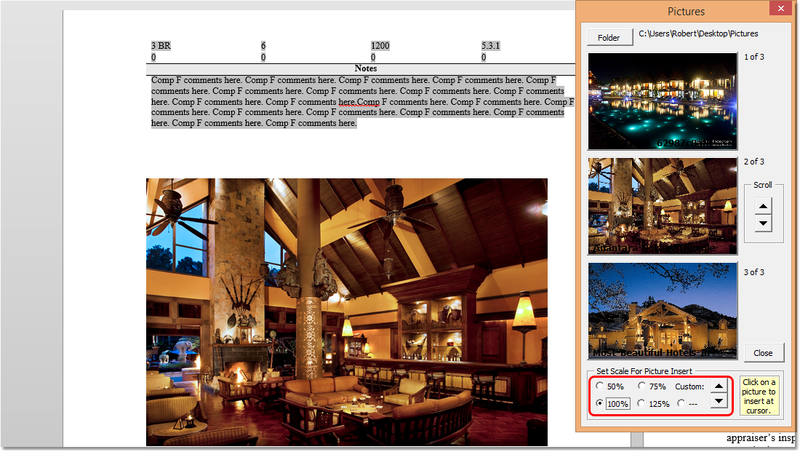 It can contain images, tables, links, fields; virtually anything that can be created in MS Word. The section has a maximum file size of 1 megabyte. 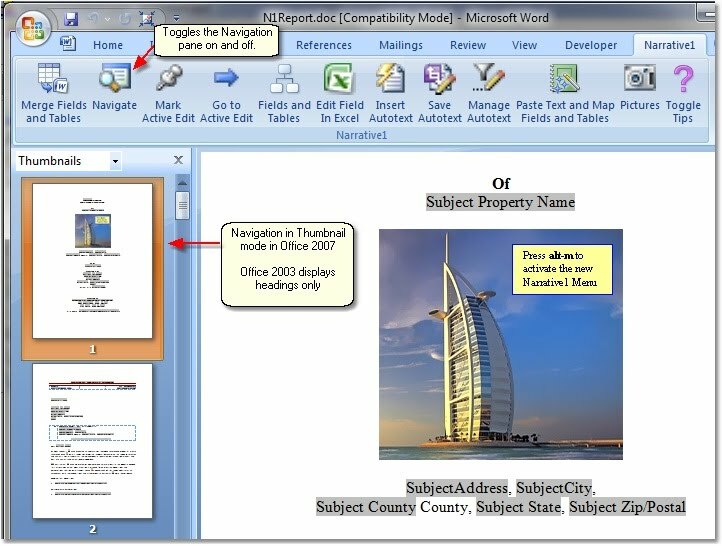 Note that Narrative1 Autotext is not related to the Microsoft Word Autotext system, which is tied to your workstation. The Narrative1 Autotext system utilizes the same network SQL database system as the comps database, which is the key advantage: Narrative1 Autotext can be accessed from all your computers. Your Autotext entries, of course, are private to your company and only accessible with your database codes. Another significant advantage is the tag system used to organize entries. An entry can have multiple tags, so entries can be efficiently sorted. Select the text in Word, then click the Narrative1 menu (top menu, right hand side). Name the entry and select tag(s) - optional - to associate with the entry. Place the cursor where the autotext will be inserted. Select an entry to insert from the list on the right. Use the tag list on the left to filter the entries displayed on the right. Autotext entries are organized by tag associations. This is similar to folders, but several tags can be associated with a single autotext entry. For example, assume there are 10 zoning entries in the system, each one tagged with "Zoning" and a city name. Selecting the Zoning tag will filter the list and display the ten zoning entries. Selecting the city name and tag will then filter the list again and display the zoning for that city. Another example might be selecting the city name tag. This would display all entries related to that city. This might include a market area analysis, zoning descriptions and assessment information. Tags are user-defined, therefore can be organized around specific locations and types of information specific to your practice. Tags are created and edited via the Manage Autotext from the Narrative1 menu. Narrative1 has a picture tool in MS Word. Activate by right-click and select Pictures.